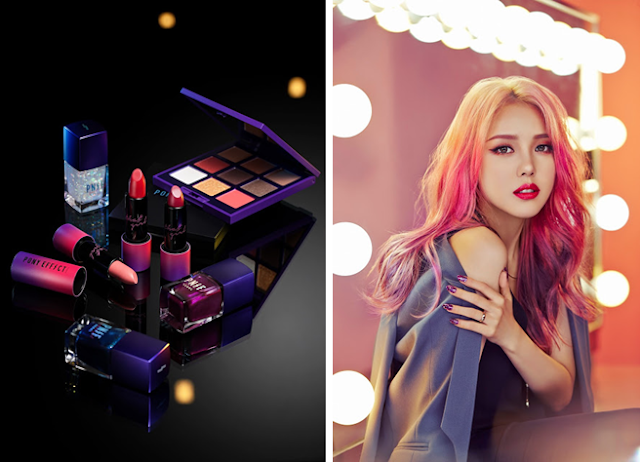 People said Pony (real name Park Hye Min), is like the Korean Michelle Phan. She is a well known makeup artist and YouTuber in Korea. She also have a beauty like called Memebox. In this Pony Effect holiday collection I got the chance to own this cool palette that is pretty much unique in my collection. Most of my collection are nudes and neutral, I'm trying to step up my game and invest in these bright and not so everyday kinda shades palette. This palette is called Pony Effect Seoul That Girl Fever Palette. Palette perempuan demam. Hahaha. Just kidding. The packaging? Pony does put a lot of effort in making her cosmetic line looking so sleek and awesome! In the collection also consist of some nail polish, lipstick and contouring palette. It comes in a black slide box, and inside it is pack in a holographic box that looks super cool, and in that box is the palette. The palette is in this matte purple case. The size is pretty good, and not bulky. It has a mirror inside and in the palette you will get 9 eyeshadows with names on it! I like when eyeshadow shades has their own individual names. Here are the swatches of the eyeshadow. You will get 3 different finishes which are : 3 mattes, 4 shimmers, and 2 glitters. On the first top row, #InCity y is a matte brown shades. Pigmented and smooth. Great for the crease color. #Overdose is a gold-bronze shimmer finish shade, smooth and pigmented. #AllNight is a soft chocolate matte shade, smooth and pigmented. The second row, #BeautifullLiar is this really beautiful burnt orange shimmer shade. #ReadyToParty is a red burgandy shimmer shade and #DrunkDial is a dark moss green with a hint of purple shimmer in it. All smooth and pigmented. The last row, #Just10Seconds, a white glitter shade with a soft green shimmers, a bit flaky and not so pigmented. Pretty good to be used for the inner corner of the eye maybe. #AllThatGlam is a yellow based gold glitter eyeshadow, a bit of a fall out, pretty good. Lastly, #BadorGood a matte red shade. Love Pony & her makeup collection, she's so talented!